Violent Crimes Investigators Need Female Subject Identified. Violent Crimes investigators need the public’s help in identifying a female subject seen here in a surveillance photo, for assaulting a woman in the parking lot of a local thrift store. The 33-year-old female complainant told deputies she was in her vehicle and was attempting to back out of a parking space. A green colored Toyota four door sedan with a Texas temporary plate of 25411PA reversed and blocked the females exit. The complainant told the female subject she was trying to back out, when the female exited the vehicle and began screaming at the victim. The female punched the victim several times in the face and spat on her. She then entered the green colored sedan and drove north on Highway 6. 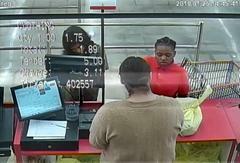 The subject is described as black female, 20 to 25-years-old, 5’3 to 5’4 in height and weighing about 130 to 140 Lbs. She has short dread locked hair. She was wearing a red colored short sleeved polo style shirt. Anyone with information on the female in the photo is urged to call the Harris County Sheriff’s Office Violent Crime unit at 713-274-9100.